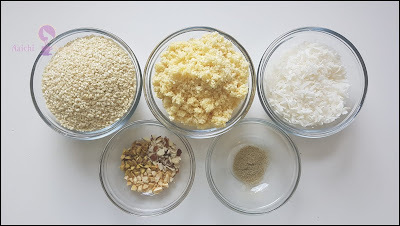 winter season, How do you incorporate sesame seeds, nuts, in your daily diet? Sesame seeds are known to be a type of fiber that can generate heat, so it is used to keep the body warm during the winter months. So get crunchy this winter with seeds, nuts and prepare this sesame karanji. I have prepared this Tilachi / Pudachi Karanji to celebrate Tulsi-Vivah(तुळशीची लग्न/देव दिवाळी) Dev-Diwali. 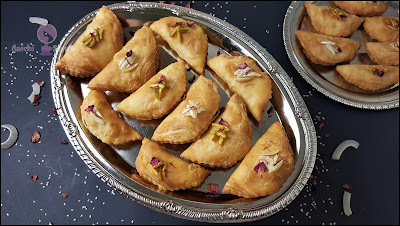 The rich flavor of roasted sesame seeds and coconut, dry nuts and the intense aroma of cardamom powder, made this karanji very special and that nobody can resist. 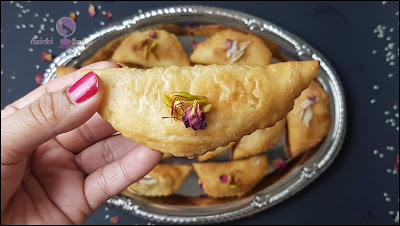 Any celebration is incomplete without sweet so here's this crispy, aromatic and delightful tilachi karanji recipe. The method to prepare this layered karanji is very easy and foolproof if you follow the instructions correctly, you will find it completely worth the effort. In a pan dry roast sesame seeds, coconut for 2-3 minutes each on low to medium flame and let them cool. sesame seeds, coconut, crushed nuts, and cardamom powder and grind to make a coarse powder. Now, add jaggery and grind to mix all and stuffing is ready. In a mixing bowl add all purpose flour, rava, and a pinch of salt and mix all well. Heat ghee and add it to the flour and mix well (ghee should evenly be mixed with the flour). using milk knead the dough(the dough should be pliable but yet not as soft as for rotis, it should be a little hard). Keep the dough covered using a wet cloth for 30 minutes. 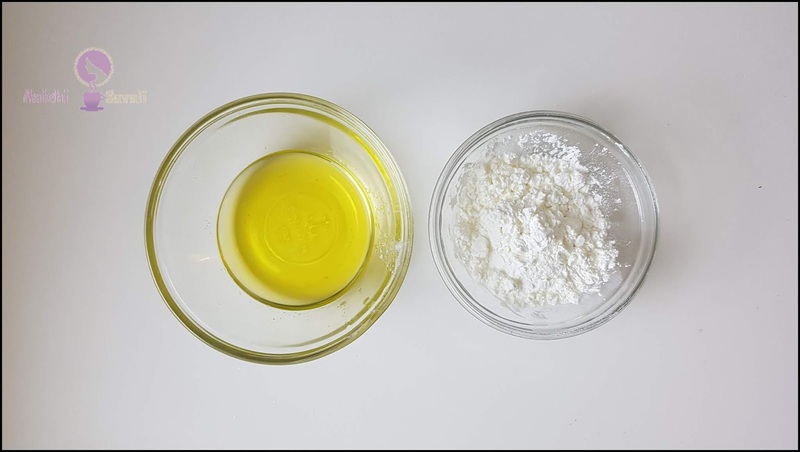 After 30 minutes, grind dough in a mixer grinder, or you may use a food processor to make it soft or knead the dough using hands to make it soft. dough ball into a 10 - 12-inch circle. 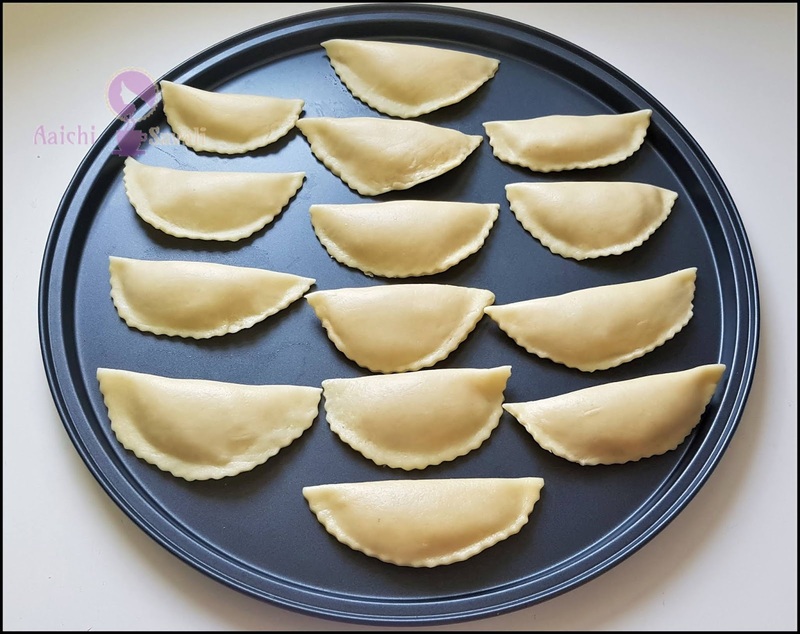 Start with the first rolled circle, apply a thin layer of corn flour- ghee paste and put the second circle on top of the first and apply a thin layer of corn flour paste on it. Lastly, put the third layer of a circle and apply the paste on it. tightly to form a long roll and cut the roll into equal discs. Roll each disc into 2.5” - 3” circle and put 1 Tbsp sesame - coconut stuffing in the center. 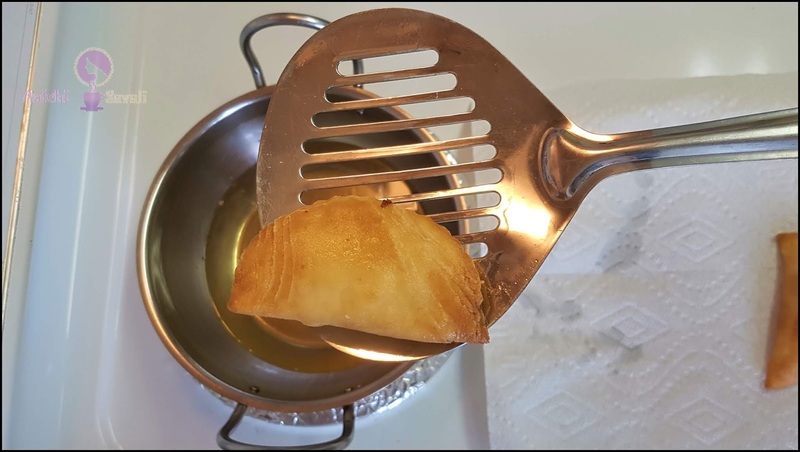 Apply some milk on edges using your finger and then fold the circle over to form a semicircle with the edges sealing the filling inside. 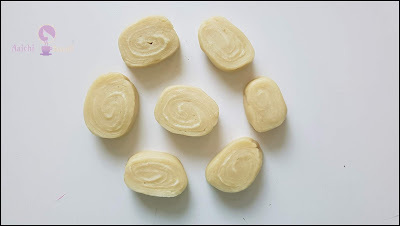 Once the karanji is sealed firmly, using designer knife make designs or using a fork press the ends to form a nice pattern or the edges can also be folded into small pleats. Place the filled karanjis onto a wet towel to avoid drying. Heat oil in a kadhai and fry the karanjis on low flame till golden brown. Remove the paper towel and let them cooled down and store in airtight container. Tadaa, crispy outside, yet moist and yummy Karanjis are ready to serve. Enjoy!!! 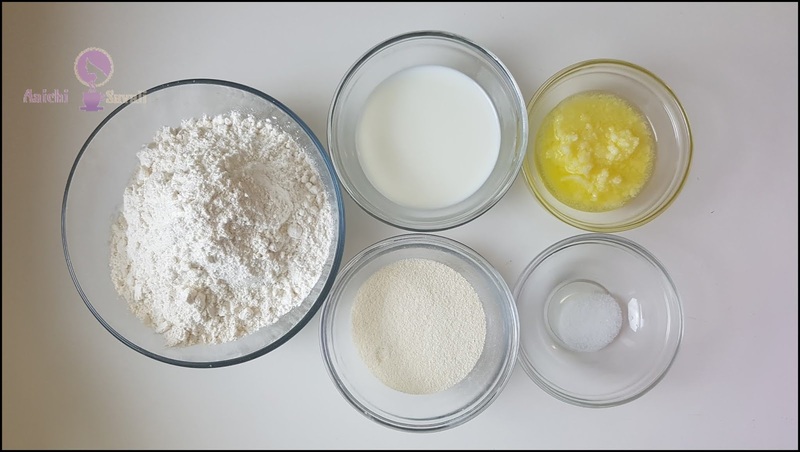 To prepare dough 3/4th cup of milk should sufficient, but depending on the rava, you may need more or less to make a firm dough. Do not flatten the disk at its center by pressing on the top as the layers may start opening as you roll them. 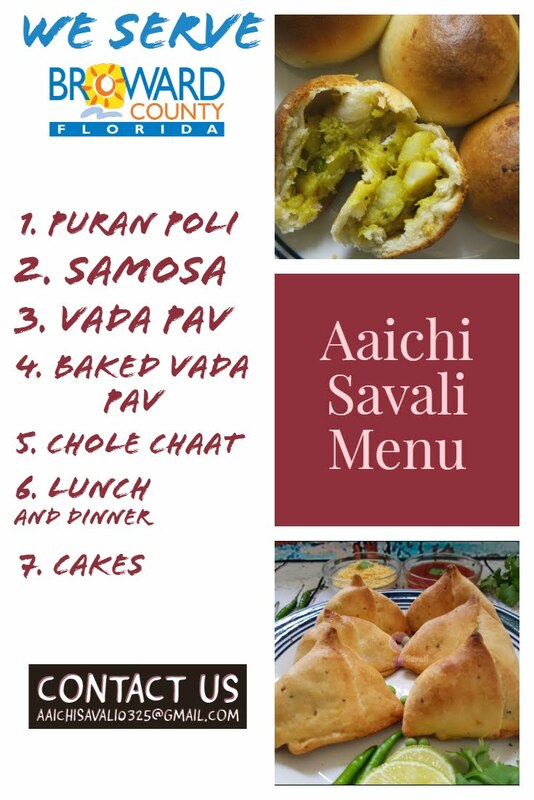 If you don't want to make sathyachi/ Pudachi karanji, you can entirely skip the process of making corn flour and ghee layering and directly make small balls from the dough and with the help of a rolling pin, roll it flat (same as the size of a poori). Stuff with prepared stuffing and fry them. Make sure while stuffing karanji, that no air bubbles remain or formed inside. It makes 33 servings. And Based on a 2000 calorie diet. 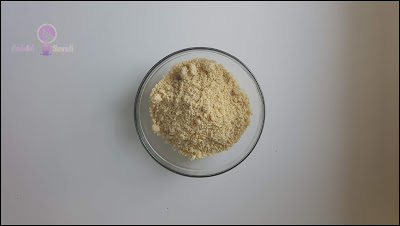 Per serving contains 140 calories, along with carbohydrates - 11.56 g, dietary fibers - 1.15 g, fats - 8.4 g, proteins - 2.1 g.
It is good to eat tilachi Karanji as a dessert or snack.